When the Lord God created our visible universe, He not only set up this universe to be governed by certain physical laws, but also imbued it with certain forces which hold it together even unto this day. Such, for example, is the force of gravity, the magnetic force, the force of electrical energy. But over and above these physical and visible forces - our universe is held together and governed by invisible spiritual forces which surpass the action of the physical ones: and these are the forces of faith and love. In two of the Sunday Gospel readings - that of the storm on the sea of Galilee and that of the healing of the youth possessed by demons - the Lord reveals to us the essence of this first force - the force of faith, and explains to us the only circumstances under which it is operative. The force of faith is mighty indeed. In his epistle to the Hebrews, Apostle Paul describes its majesty to us as seen in the example of the Old Testament righteous ones. Through faith - says the Apostle - these righteous ones performed extraordinary feats: they vanquished kingdoms, stopped the mouths of lions, quenched the violence of fire, turned to flight entire hosts of aliens. Of course, one may think that such feats are possible only for saints and righteous ones, but are unattainable by ordinary sinners. However, in the narrative about the storm on the sea of Galilee we see Apostle Peter - at that time simply one of Christ’s disciples, an ordinary fisherman, - superceding by his ardent faith the laws of nature and walking on water. And in the subsequent Gospel reading we see other disciples of Christ, still ordinary people because the grace of the Holy Spirit had yet to descend upon them. However, through their faith in the Lord Jesus Christ they had supernatural power over the forces of evil, they had power to expel demons from people, and it was for this reason that the poor father, who had a son possessed by demons, turned to them for help. And what do we see, dear brethren? 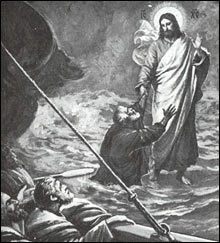 The Apostle Peter, who so easily treads water, begins to drown, while Christ’s disciples are unable in this case to cure the possessed youth. Why is that? It is at this point that the Lord reveals to us the requisite condition for faith to have its extraordinary effect: it is not enough to have just a little faith, or to believe somehow; no, faith must be firm, indubitable and absolute. Herein lies the key to the use in our everyday lives of this great spiritual force: the force of faith. When the turbulent waves of the sea of life overwhelm us, and it seems to us that we are drowning, - let us not be found lacking in faith, but instead, let us firmly believe that, sooner or later, with God’s help we will be able to overcome all trials and tribulations. When various misfortunes, calamities or insurmountable barriers rise up in our path, - let us not lose our faith, let us not doubt, but instead, let us firmly believe that with God’s help we will be able to cope with all the difficulties. But if it should happen that we fall into a state of disbelief or doubt, and we being to sink in the sea of earthly misfortunes, then let us follow the example of Apostle Peter, dear brethren: just as he, beginning to drown, immediately cried out to Christ for help, so must we cry out to our Saviour in the words of the father of the possessed youth: “We believe, o Lord, help our disbelief!” Amen.